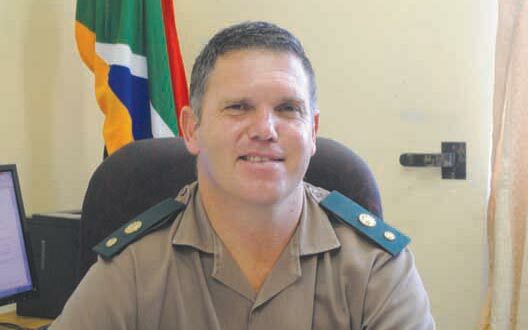 As of 19 February 2018, Mr Christiaan Vosloo is the new Head of Correctional Services in Mkhondo. Mr Vosloo has been working for the Department of Correctional Services for 27 years. Beginning in 1991, he started working as a Correctional Official in Pretoria and through the years he was promoted several times. In July 2005 he received the position of Senior Correctional Officer (SCO): Youth Affairs at the National Head Office. In June 2006 he received the position of SCO: Research/Profiling and before coming to Mkhondo, he worked at the Gauteng Regional Office in the position of SCO: Correctional Administration and Regional Auxiliary User from August 2012. On receiving his latest position, he was also promoted to Assistant Director. Even though he has filled numerous positions over the years, he has worked mostly with the rehabilitation of prisoners. The aim is that, when they are released from prison, they do not return to a life of crime. In 2008, he received his National Diploma in Youth and Child Development from the University of South Africa and in 2015, he obtained a BTech degree in the same field from the Durban University of Technology. In his private life, Mr Vosloo has a passion for coaching rugby. In 2015 he received his World Rugby Level 2 certification and he has coached numerous teams over the years. Apart from a few school teams, he also coached the Trans Oranje School for the Deaf, the Naka Bulle/Dragons Youth Rugby Club and the Blue Bulls Youth Rugby Association. Mr Vosloo is married to Corlia with a son, who is currently in matric, and a daughter, in grade 9. Mr Vosloo stated that his new position is a challenge for him, but he is very excited about it. He believes it is important to maintain a positive outlook in life and always look for solutions rather than to find problems. He admits that everyone makes mistakes, but it is important to always learn from your mistakes so that you can move forward from there. Good luck to Mr Vosloo with his new position. With his positive attitude the standard of the local prison can only increase.